This Marshalls-sponsored trend report examines the market for crash-tested street furniture, specifically procurement trends and the views of architects, security professionals and other specifiers on the importance of aesthetics. Recent terror attacks in Paris and Berlin, as well as periodic incidents of drunk or reckless drivers veering off the road, have tragically highlighted why crowded places such as shopping centres, plazas and sports stadia perimeters increasingly need crash-tested barriers that can resist the force of moving vehicles. Analysing the results IFSEC Global and Marshalls have put together a report: ‘Aesthetically pleasing, crash-tested street furniture: why functional will no longer do’. Simply complete the short form to download this free report. 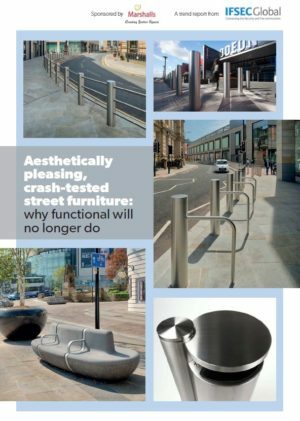 Aesthetically pleasing, crash-tested street furniture: why functional will no longer do This Marshalls-sponsored trend report examines the market for crash-tested street furniture, specifically procurement trends and the views of architects, security professionals and other specifiers on the importance of aesthetics.